Do not be a chameleon. Do not change for others. Do not attempt to blend in. Do not adopt others ways, beliefs or ideas. This is not the way to have true relationships with others. How can you have a true relationship with another when you do not know your true self? If you continue to adopt others beliefs, it can lead to unhappiness and broken relationships, since people will eventually start to pick up on something not necessarily “right”. The way to a fulfilling happy life with true relationships is to be your true self. 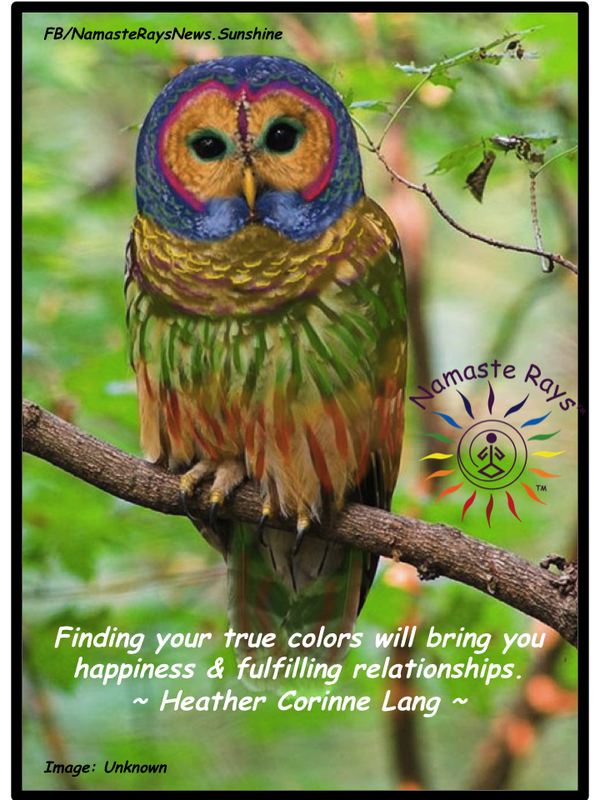 Finding your true colors will bring you happiness & fulfilling relationships. Discover the true you and be the true you. Once you find your true self and share it with the whole, you will find you have more true relationships in your life. I used to be a chameleon, blending in, matching others’ personalities, styles, likes & loves, to be “one” of the group. I constantly moved within different types of groups, changing my colors to fit in. Once I realized I was doing this, and started peeling away these layers of “others”, I started finding my true colors. My style, my loves, my beliefs, my personality. Once I became more comfortable with the real me, I attracted others who had similar likes, loves and beliefs. I attracted others who were open-minded, as well. Perhaps not necessarily on the same wavelength on all beliefs, but not judging me for mine and still accepting me. Just recently I had a conversation with a couple of my yoga students. Both have had Reiki from me, and both came to me for Reiki because they trusted me from yoga. One admitted she was hesitant and it still worked for her and I told her it’s because you trusted me from yoga. She believed in what I said because she came to yoga, listened and practiced and ended up loving yoga. So, in turn, she tried Reiki…she was open-minded to it. It worked for her and helped her heal an injury quicker than it would have without it. I consider her and all my yoga students true relationships. I have many others, but this is how it works. When you show your authentic self, you believe in you. Others will sense the authenticity in you. When you show your true colors, people can see the real you. You show others how you respect and honor yourself, and others will do the same. When you are a chameleon, always blending in, people will sense it’s not really you, and these relationships are never very deep or fulfilling. I have been the chameleon and I have been around them. You will know that feeling and perhaps already recognize it in yourself or another. You can’t change someone else…but you can change you to shed the layers which do not fit you anymore or perhaps never did. You can transform yourself into the authentic version of you. Use the information, feelings and beliefs from past relationships where you tried to fit in as it helps you understand yourself better. You can ask yourself questions such as “Do I still like this?”; “Do I still believe in this?”; “Does this resonate with me?” Doing this exercise will help you discover your true inner you, your true beliefs, your true personality and your true colors. And, once you know YOU, it can lead you to a better understanding of your life’s true purpose…fulfilling you, bringing out your joy & finding other true individuals. It did me. P.S. If you would like to book a Reiki appointment with me, please message me on http://www.facebook.com/NamasteRaysNews.Sunshine or email me at heather clang@yahoo.com.